My name is Mario Farulla and I am born and raised in Rome. I left Italy when I was 19 years old to travel the world and worked in England, Azerbaijan and the Middle East. I collected my experience from working in five-star hotels and bars, such as the Four Seasons, the Marriot group and Galvin Brothers (a Michelin Star restaurant group). Eventually I decided to come back to Rome and work in my home city. I’m now the bar manager of Baccano, a restaurant in the Trevi district, and I am very proud because we just won the 3rd best cocktail bar in Italy and personally, thanks to my team, I won the best bar manager. Even if we are a high volume bar, we maintain classic service and I try to incorporate my personal touch, mixing Calvados and Cognacs with classic Italian cocktails. Because I used to work in a hotel bar and high-level service was first and foremost, my dream bar would be a hotel bar here in Rome. The style would be very close from the Dandelyan, great service and good vibes in a modern style. It’s complicated in a hotel, but it’s my dream bar, so we wouldn’t have a menu so we could offer a bespoke service to customers with bespoke cocktails. Take my time, chill and take long walks in the city with my girlfriend. As I told you, I try to twist classic Italian cocktails with other spirits. Cognac is my go to and my favourite brand is Godet. This spirit is the root of mixology, with it, you can come back to the origins of drinks. I love a good Manhattan with cognac which is known as a Harvard cocktail. For me a good cocktail can be complicated or easy, as long as it’s the right drink for the customer. I am Italian, so of course I love vermouth and I work more and more with white vermouth. My favourite cocktail is a Dry Martini served in a very cold glass. You need to go to visit Giacomo at Paradiso, he does a great job in Barcelona. 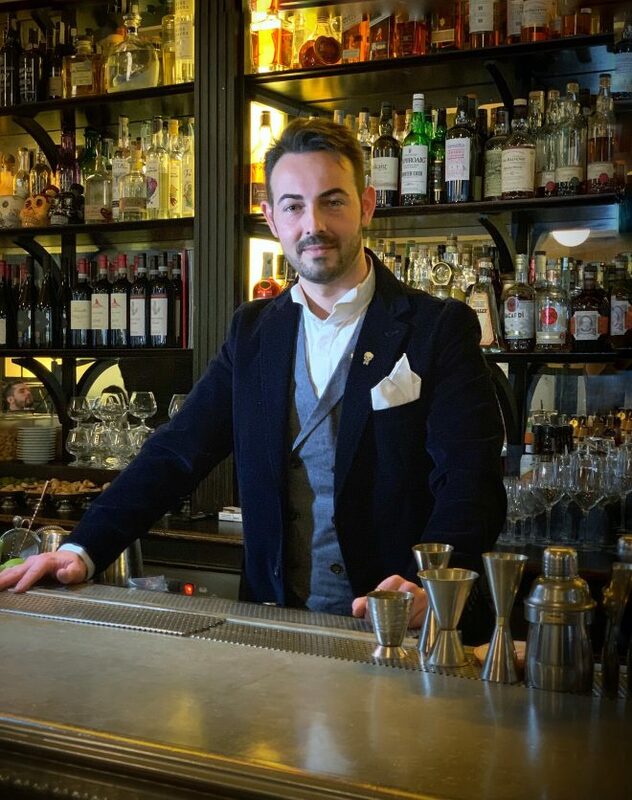 I am eager to discover the new venue of Daniel Schofield in Manchester, the Schofield’s Bar, which will open this year and Remy Savage at the Artesian in London, is always ahead of the game. Thank you to Blue Blazer for inviting us to Rome and making this interview possible.